I’ve promised to do a write-up of MachinimaNight III to all who attended – share the links to the films and artists. I’m going to do this back to front and start off at the last part. Mostly this is for Scott and Jill who had to leave early. I appreciate your interest and support! Thanks! So in the course of the night I had introduced the audience to different genres and types of machinima, mostly concentrating on form and not about the creative communities within machinima making communities. This is the ingredient of machinima that fascinates me the most and there’s one group that I’ve been paying attention to and just downright adore. So first – let me introduce you to Olibith. For this years Bergen Machinima Night we were honoured by a visit from Dr. Tracy Harwood who had a fascinating presentation about what machinima is, where it is going and why. Morten Kvamme (curator at Landmark) and I had dinner with Tracy before the event and I think we were both charmed , inspired and bedazzled. Midway through the dinner Morten observed that the three of us had different angles of interest with Machinima, hence our collective intelligence makes up a 3D perspective. I’m focused on gameplay functioning as narrative, Tracy on the tribe culture and Morten’s interested in Game Art. Needless to say, I was elevated to some cloud up up up – way beyond consciousness. Yup! We’ll be going at it again. I was so pleased with the turn-out last year and I hope it will be just as succesful this year! 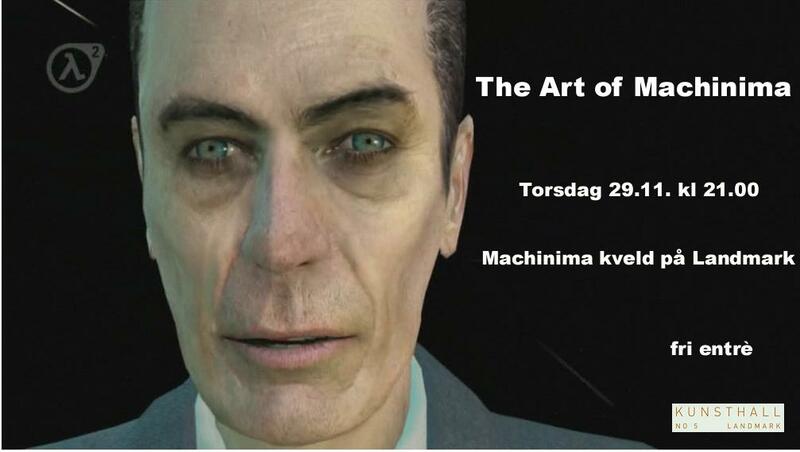 On the 13th of November, Tracy Harwood, the manager of the European Machinima Festival 2007 will be visiting us here in Bergen to talk about machinima. There’s still some organising left. But she definitely is coming and we’re really pleased about that! It will be great to have an expert to listen to! There will of course be viewings of films. If anyone has anything new they want to show – please let me know! Anyways…November 13th! We look forward to seeing you there! I’ve been so back and forth about how to organise this event that I’ve completely lost track! Time to bunker down, I think. I was fiddling with the idea of creating a work shop type event – but I think I’ve let that idea go into the “when I have the energy to be overly ambitious” file. I leave you now with some documentary footage of the machinamite! Enjoy! Marianne Westerlund wrote a great piece for Bergens Tidende, the Thursday paper – unfortunately I can’t find it anywhere online – which is a real bummer really. I asked most of the people who had showed up if they’d read it, but most shook their head and told me they never read the paper version anymore. Well – there’s some food for thought! But she wrote a great article where she had interviewed quite a few machinima artists about their art, which was just really really interesting. There’s also an interview with me – hehe – it was weird seeing the words “Says Linn Søvig while shaking her head”. But really cool as well – she’s a great journalist and I hope to read much much more of her stuff in the future! Thanx to Morten at Landmark. Sigh – thinking of having one framed! Tihi! Oh good golly I’m tired! Thankfully I work in a place that has as much coffee as I can drink. Last night I came home from work and just crashed on the couch – thinking the world, work, the future and especially – all things digital was just gonna have to wait till today. I’ve found the logistics of organising a machinima event stressful. Since I don’t know what I’m on about most of the time, I get even more stressed. It seems everyone else is just laid back and doing their thing and silence just kills me! During the past few years I’ve become accustomed to feeling like an e-mail spammer – but I still get overly dramatic! How dare people have other things to do than help me – for free! So I creep into my apologetic default position “so sorry, so sorry” – which to be honest, is even annoying me now. Either my googling skills have turned to dust or I’ve never been good at it. I’m trying to find the source to animpinabox’s Dance World of Warcraft. I can only find the YouTube video or Google – which will not do when showing stuff on the big screen! Anyone? And the Village Elves which has been banned from YouTube – fooooooools!!! I can’t find it anywhere. Any hey – you brilliant Machinima makers – some of you are a tad too shy and your contact details are impossible to find! Why? Are you hassled by people like me who want bigger and better quality files so much? Oooh – yeah! I’m missing a film for our storytelling segment. The two I have are both in The Sims – any other good storytelling machinima that’s not from The Sims? Landmark, 9 pm – November 29th! Ooo – I’m nervous – excited and all over the place right now! Phew! I’ve been toying around with an idea for months now, not actually getting anywhere – but it’s still there on my list of priorities. 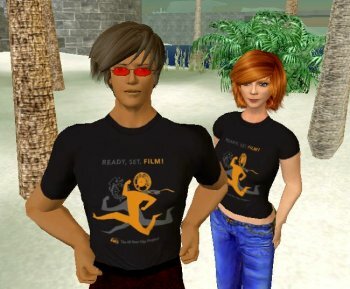 I want to rent a cinema theater for a day and show Machinima films. A kind of mini-Machinima festival. My idea is to make it as commercial as possible so that people who aren’t avid gamers will be interested in attending as well. I’ve decided that this is possible if I can organize machinima films in forms of genre. Drama – action – horror – a.s.o. I know! It’s a headache. But I think if I separate the films from the games, people might be more open. The whole point is to give an introduction to the magnificence that can come out of user-generated content. And of course the relevant fact that games are being used as a medium to express something.